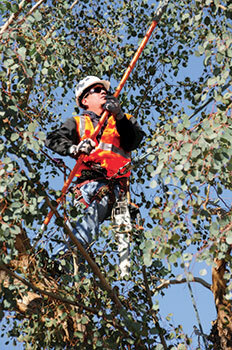 Among the educational offers Desert Classic covers is certified arborist training. Labor is a top challenge for Desert Classic. As the company strives to attract and retain employees through a variety of methods, perhaps the most successful effort has been covering certification costs for its team members—an expense Murray says is well worth the investment. Tell us about how you encourage employees to increase their knowledge and education. We belong to the Arizona Landscape Contractors’ Association (ALCA). They have a couple different certifications my employees participate in: the Arizona Certified Landscape Professional and the Sustainable Landscape Manager Certified program. The way I approach it is, I’ll pay for you to go as long as you continue to attend the classes and pass. I feel it gives us a leg up against some of our competitors. When my account managers are off in the field with clients or an HOA board, they know what they’re talking about. Things are changing all the time, so I want them to have that education background. We’re a more educated company, so we have more to offer our clients and then it also allows us to be more profitable as a company. At the end of the day, you’re only as good as your reputation and your bottom line. If your reputation is there with the education and you can also be financially responsible, you stay in business. How long have you been doing it this way? We started three years ago, and it’s gotten us more internal candidates to be able to move up within the company. Guys were finding out that, “Hey, I’m not going to be stuck as a crew member my whole life. I can go and get a certification and have the opportunity to do better for myself.” That’s been a huge thing for us. 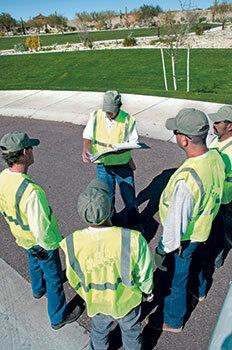 State associations offer learning opportunities for workers. We just recently promoted two foremen to assistant account managers. They’ve worked their butts off. They deserve the opportunity. They went and got classes, and they did the things they needed to do to better themselves. Now they’ve got a better career. When you bring somebody in from the outside in the green industry, unfortunately, you’re never quite sure what you’re getting until they are performing the job for you. I would much rather promote from within. They sign a document that says that if they leave within the year, they have to reimburse us. I feel that’s pretty fair. As long as they stay for a year, then I’m cool. I feel that’s a good investment. I really do believe that if you take care of your employees, they’ll take care of clients. This is one way I can do that. Everyone wants to make more money, but sometimes it’s not about that. It’s about showing some respect for their ability and also doing something a little bit different than some of my competition. My employees want to stay here, they want to work here, they want to move up in the company. We want to try to foster that mentality and that culture. How many people have you put through certifications? There’s probably about 20-25. I’ll spend around $20,000 this year on certifications and education. I really believe in it. For years, our industry didn’t really have a lot of education. The last three to five years, ALCA has worked really hard to put those programs together, so we can become a more educated industry and a more respected industry. Desert Classic Landscaping, Phoenix, Ariz.